The FNCA 2017 Workshop on Nuclear Security and Safeguards Project took place in Mito/Tokai, Japan on 19-21 September, 2017. 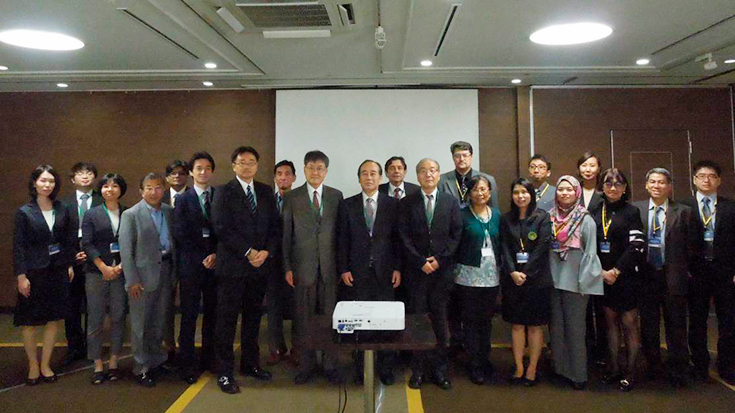 This workshop was hosted by Ministry of Education, Culture, Sports, Science and Technology (MEXT) of Japan. Mr. Yuichi Michikawa of Ministry of Education, Culture, Sports, Science and Technology (MEXT), Japan, and Mr. Tomoaki Wada, FNCA Coordinator of Japan, delivered opening remarks and the Workshop was officially commenced. After the Opening Remarks, each Workshop member introduced him/herself. The 7th Workshop had total twenty six participants from ten countries, including Bangladesh, China, Indonesia, Japan, Kazakhstan, Malaysia, Mongolia, Thailand, Philippines, and Vietnam. After the intoduction of the member, Mr. Masao Senzaki, FNCA Nuclear Security and Safeguards Project Leader of Japan, moderated the adoption of the agenda. The agenda of the Workshop was adopted by the participants and the meeting with nine sessions was opened. Technical visit was conducted at Nuclear Science Research Institute of Japan Atomic Energy Agency (JAEA). Dr. Abid Imtiaz, Bangladesh Atomic Energy Commission (BAEC), Bangladesh (Session 2). A total of 10 FNCA member countries (Bangladesh, China, Indonesia, Japan, Kazakhstan, Malaysia, Mongolia, Philippines, Thailand, and Vietnam) presented their country reports that included developments and improvements since the last Workshop regarding implementation of safeguards and nuclear security, promotion of nuclear security culture and capacity building activities. All countries reported close cooperation with international or regional organizations and other countries to strengthen safeguards and security capacity. Almost all countries have taken initiatives to develop human resources on nuclear security and safeguards by organizing training courses, seminars, and workshops, with the cooperation of the IAEA and other countries and organizations. The Summary of the country reports were covered in Session of Country Report Summary. The moderator opened the Session with the statement that nuclear forensics is now recognized as one of the critical capability of a state's nuclear security regime. Mr. Tomikawa (Japan) outlined the activities of JAEA for developing nuclear forensics technology. He introduced four key technologies (isotope ratio measurement, impurity measurement, uranium age determination, and particle/morphology analysis) for nuclear forensics analysis which JAEA has been developing since 2011. He also made it clear that even though Japan do not have a physical nuclear forensic lab at this point of time, he and his team managed to carry out nuclear forensics analysis and R&D by using available related equipment at JAEA. JAEA is also developing a prototype Nuclear Forensics Laboratory. Although Japan does not have its National Nuclear Forensics Library (NNFL) yet, experience and knowledge obtained by JAEA through developing NFL is expected to contribute to the development of NNFL in the future. JAEA is also collaborating with US Department of Energy (DOE) and European Commission Joint Research Centre (EC/JRC) to further develop a more accurate and precise method for NF analysis. Mr. Tomikawa conclude his presentation by conveying his hope for future prospects, where among others, the process of validation of NF techniques can be improved. Ms. Mungpayaban (Thailand) presented the nuclear forensics capabilities in Thailand. The Nuclear Forensic Lab in Thailand was established in July 2014. Now, the Lab is equipped with the Scanning Electron Microscope with Energy Dispersive Spectrometer (provided from EU) and XRD and mobile XRF equipment. Thailand received support from EC/JRC under the Project 30, which is a network of excellence for nuclear forensics in South East Asia Region. The Project 30 aims at supporting regional security by upgrading nuclear forensics capabilities, and providing equipment for the laboratory in order to serve as a hub laboratory within the regional network. OAP also works closely with the frontline officers to exchange knowledge and conduct exercise on crime scene management. She also extended the intention to provide the measure of long term for prevention and mitigation of nuclear terrorism among the ASEAN region. Mr. Yoshiki Kimura (Japan) opened the roundtable discussion by analyzing the results of nuclear forensics questionnaire. The questionnaire was sent to participants of the Workshop in advance, which aimed at sharing the information among the FNCA member states on the current status of nuclear forensics capability of each country, and to identify needs on the collaborative activities in FNCA. The result shows that most of the FNCA member states have basic capability or at least started to build nuclear forensics capability. The result also illustrates the common challenges among the member states, namely development of national framework, NNFL, and forensics interpretation and findings capability. The participants discussed how to further enhance each state's capability. One proposal is to use already available resources for nuclear forensics. Rather than developing a brand-new nuclear forensics laboratory from scratch, it is more efficient to use technology and equipment already developed for different purpose. Some participants argued that establishing chain of custody is also critical to develop national response measures to nuclear security event, such as transporting evidence from the crime scene to the analytical lab. For the future activity of the Project for enhancing nuclear forensics capability, participants welcomed the proposal by Japan to organize a tabletop exercise on technical issues of nuclear forensics in 2018. Thailand will also seek the possibility of hosting a hands-on exercise of nuclear forensics analysis at their laboratory in 2019. First, the moderator presented the status of the FNCA member states with regards to the AP, Broader Conclusion and implementation of Integrated Safeguards. Then he discussed a proposed set of fundamentals to implement SG obligations to meet the IAEA requirements. In addition, he presented examples of good practices addressing reporting aspects and having the need for responsible designated staff to ensure successful implementation of the IAEA activities, in particular during complementary access activities and for providing the IAEA with declarations as required in the AP. He emphasized the need for trained staff familiar with the AP Annex II items. Ms. Seguis (Philippines) presented legal framework of the Philippines. She emphasized the commitment of her country to fulfil its SG obligations. She discussed the facilities under safeguards, as well as its current status. She also presented the timeline for submissions of AP declarations to the IAEA. This facilitates the assurance of timely reporting requirements. Further, she emphasized on the key experiences in designating locations outside facilities (LOFs), its difficulties and how the country managed to collect the relevant information. In hosting complementary access, prior to AP implementation, being prepared with administrative and technical aspects are necessary; a mock CA scenario was helpful for this preparation. Assistance from the IAEA, USDOE/INSEP, ASNO and other organizations had been instrumental in the country's successful AP implementation. Mr. Hiep (Vietnam) presented the development of the regulatory authority of Vietnam (VARANS). He described its responsibilities and functions; the relevant legislation and regulations. He emphasized that Vietnam exclusively uses nuclear energy for peaceful purposes. On the aspect of AP, Vietnam is on its 4th year of AP implementation and continued to keep its broader conclusion. Outreach activities related to AP Annexes I and II were conducted with different organizations, specifically those related to industries. These outreach activities promoted more cooperation and better understanding of the required AP declarations. The outreach is still continuing. For the roundtable discussion, the moderator proposed to formulate a collective knowledge from the AP experience of FNCA member states. This would address the agreed set of fundamentals on the implementation of the AP and a compilation of examples of good practices. The objective, as a result of this plan, is a document/report for publication, either on the FNCA webpage or when possible as an INFCIRC through the IAEA. It was proposed that FNCA members provide input of good practices and examples before the end of 2017. The input will be compiled by ISCN/JAEA and the results (without naming the country or the specific facility) will be presented for discussion and further actions for the next FNCA meeting in 2018. It was suggested that ISCN prepares and distributes a template with few examples based on experiences in Japan. This template will be used to compile the report for the FNCA meeting in 2018. The proposed plan for this project was supported and agreed by the FNCA members. Mr. Hirotaka Oku (Japan) introduced Japan's current efforts on enhancing security of radioisotopes. Currently, there are over 8,000 users of radioisotopes in Japan, and that number is increasing in recent years. At the same time, though the numbers were small, there were some incidents of leakage, loss and false disposal of radioisotopes in the past. Japan received IAEA Integrated Regulatory Review Service (IRRS) Mission in 2016, and accepted Mission's recommendation to reconstruct regulation to include security measures. The reconstructed regulation will require licensees who have radioisotopes beyond D-values tighter security measures. About 500 licensees are subject to this security regulation, and they will be required to have detection, delay, response and access control, etc. to security event at their facility. The reconstructed regulation is expected to be implemented in 2019, before 2020 Tokyo Olympics/Paralympics Games. 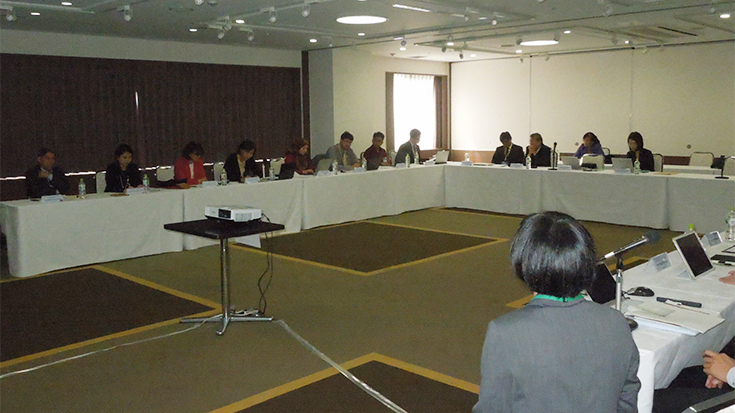 Ms. Noro and Ms. Matsuzawa summarized the country reports resented in the Session 1 and 2 of the workshop. The Summary is attached to this report as "Country Report Summary." The updated Country Report Summary will be posted on the FNCA website. Mr. Yosuke Naoi, Chairman of IAEA Nuclear Security Support Centre (NSSC) Network, illustrated the activities on IAEA NSSC Network. Primary objectives of the NSSCs are developing human resources through the implementation of a tailored training program, developing a network of experts, and providing scientific support for the prevention and detection of and the response to nuclear security events. As of September 2017, 60 member states, 66 institutions, 5 observers join the NSSC Network. The past achievements include raising awareness of the NSSC concept, improvement of information exchange and coordination at international and regional levels, increased interactions between NSSCs and academic institution, and initiation of NSSC experience sharing visits and case studies for sharing good practices and lessons learned. Mr. Naoi concluded that the NSSCs are key players to support sustainability of national nuclear security regimes and to support implementation of IAEA activities. Mr. Rismawan (Indonesia) shared Indonesia's experience of developing NSSCs. In 2014, Indonesia launched I-CoNSEP, an inter-agency framework for collaboration on capacity building for nuclear security and emergency preparedness. Primary roles of I-CoNSEP is to support human resource development and provide technical and scientific support. Other than I-CoNSEP, there are several NSSCs in Indonesia. Both regulatory authority (BAPETEN) and the licensee (BATAN) have training center (CET); BATAN launched NSSC for nuclear security culture assessment (CSCA); and several universities are collaborating to establish a research center for nuclear security. All NSSC activities are coordinated under I-CoNSEP. Mr. Rismawan concluded with note that effective coordination among the security-related national entities are important to improve awareness and understanding of nuclear security, and through a planned education and training program, it can improve the capability of security. Mr. Gu (China) introduced activities of China's COE. The State Nuclear Security Technology Center (SNSTC) launched the COE in March 2016. COE provides training on nuclear security, NMAC and nuclear export control to domestic and international audiences. COE also has functions of equipment testing and certification, R&D and technical demonstration, and international cooperation. It is consist of analytical labs, environmental test lab, physical protection testing field, response force training facility, mock nuclear material bunker, and NMAC training facility. China collaborates with international partners such as IAEA and US DOE to co-organize training and train SNSTC trainers. China is also active to enhance collaboration among regional partners for the improvement of regional nuclear security. Mr. Jaime Vidaurre-Henry (Japan) opened the roundtable discussion by proposing COE collaboration to share experiences and good practices of capacity building in nuclear security and safeguards. The participants welcomed such proposal. Mr. Wada briefed on the result of the 18th FNCA Coordinators Meeting (CDM) held in Tokyo in March 2016. FNCA Coordinators performed ex-ante evaluation of 6 project proposals including Nuclear Security and Safeguards Project. CDM agreed to start new three-year phase of the Nuclear Security and Safeguards Project. Nuclear forensics, cyber security, and security of radioactive sources were three key topics identified by CDM to be discussed intensively at the Project in order to build an effective international mechanism for nuclear materials security in the region. CDM also expects the Project to promote human resource development in nuclear security. Mr. Wada also described other FNCA projects. 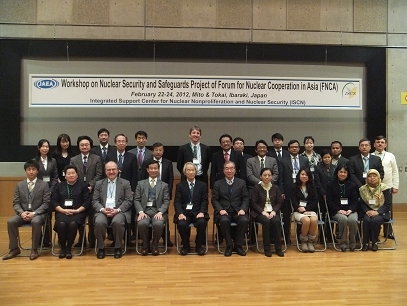 Mr. Senzaki overviewed the past three-year achievements of the Nuclear Security and Safeguards Project. He also introduced the Resolution of the Ministerial Level Meeting (MLM) of FNCA which addressing the importance of continue enhancing nuclear security and safeguards capabilities in the region, and then outlined the new direction of the Project. For nuclear security, the Project will focus on nuclear forensics, cyber security, nuclear security culture and security of radioactive sources. For safeguards, the Project will compile a generic set of good practices on AP implementation of FNCA members. For capacity building, the Project will share good practices of nuclear security and safeguards training among COEs of FNCA members. Moreover, the Project will seek every opportunity to publish its achievement. The proposal will be distributed to the FNCA members for further comments. Summary of the Workshop was introduced by Ms. Naoko Noro (Japan). It will be distributed to the participants for confirmation. Mr. Senzaki (FNCA) and Mr. Shoji Kasuga of Ministry of Education, Culture, Sports, Science and Technology (MEXT), Japan, delivered closing remarks and the Workshop was officially closed.